By the time The Sitter came out in 2011, most of us agreed that it was too late to save its director, David Gordon Green, for the auteurists, the cinephiles, and the acolytes. With the one-two punch of Pineapple Express , which had enough manic energy and bright character support to keep a simple premise afloat, and Your Highness , which didn’t, the great indie hope that Green had represented as the writer and director of such masterpieces as George Washington  and All the Real Girls  seemed to have lost the battle against idiosyncrasy. And with his loss came ours: gone were the autopoetic Malickian narration, the earnest and sensual dialogue, and the slo-motion shots of the American South. In their place were pot-driven non-sequiturs, an intellectualized crudeness of spirit, and most disappointingly of all, undistinguished visual style. The following year, though, came a surprise: soon after moving to Austin, TX, I was shown Green’s under-the-radar return to form, Prince Avalanche , a charming two-hander featuring excellent character work by a mustachioed Paul Rudd and a dopey Emile Hirsch. As construction workers helping to repair a burned-out portion of central Texas, Rudd and Hirsch made for a contemporary Laurel and Hardy, while Green’s writing and direction somehow fused the beauty of his early work with the laconic vibes of Pineapple Express. And prolific as ever, while continuing to produce such special work as Craig Zobel’s terrifying Compliance  and longtime collaborators Danny McBride and Jody Hill’s Eastbound and Down (for which D.G.G. 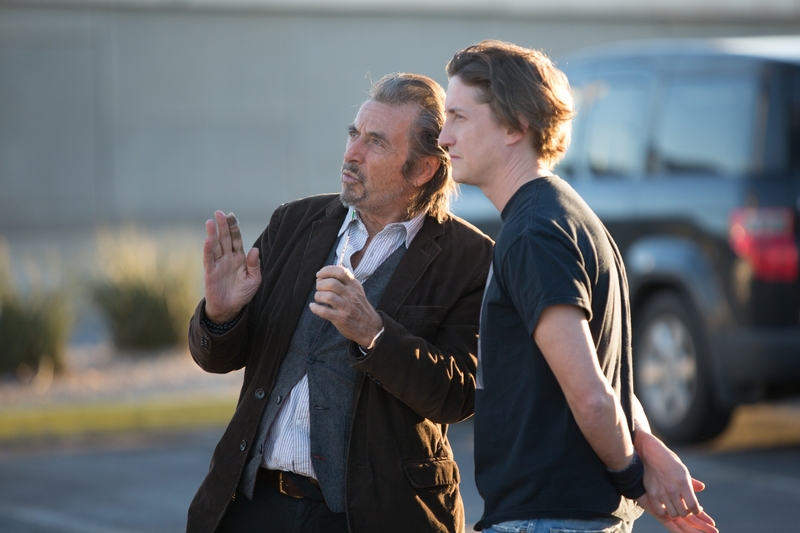 also directed, with strokes of genius), Green immediately had another film in the can: Joe, a 2014 SXSW Film Festival selection with one of Nicolas Cage’s best performances. As a not-quite-unrepentant completist critic, following Green’s career has been an enormous personal frustration; and time and again, he’s delivered interviews about why he chose to take commercial projects (and commercials projects) on which he employed his trusted crew, like producer Lisa Muskat, cinematography Tim Orr, and composers David Wingo and Explosions in the Sky. I respect this loyalty and assuredness greatly, but Green’s willingness to suppress his aesthetic abilities and his eccentricity in favor of big-budget style has made watching his new films an unpredictable and distressing prospect. Will the newest work be in the realm of Rick Alverson’s The Comedy , which Green executive-produced to spectacular effect with McBride and Hill, or closer to Joe, which failed to complement Cage with the necessary twists of plot or tension on which a violent thriller usually runs? With these concerns in mind, I readied myself for Manglehorn, an IFC Films release that the director shot from a script by his friend, Paul Logan, in 2014. 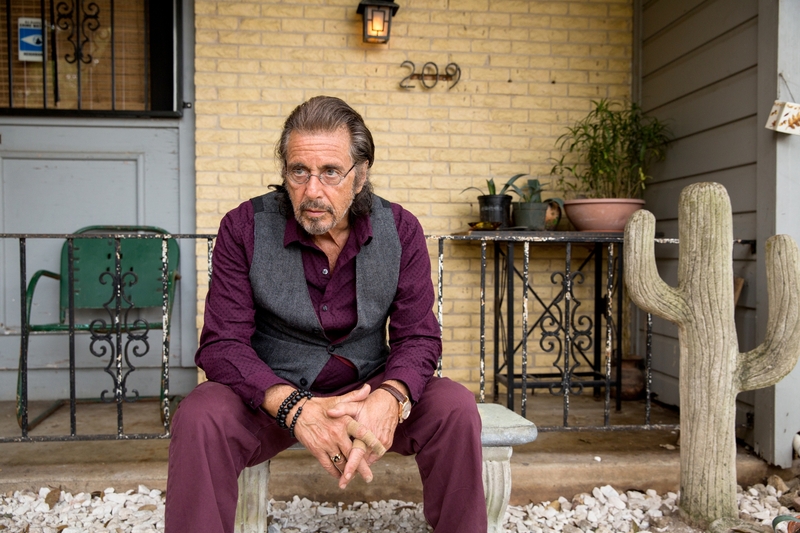 Logan wrote the feature exclusively for its star, Al Pacino, an outsized actor not clearly suited to the quietus and the insularity of Green’s Southern-set indies. As A.J. 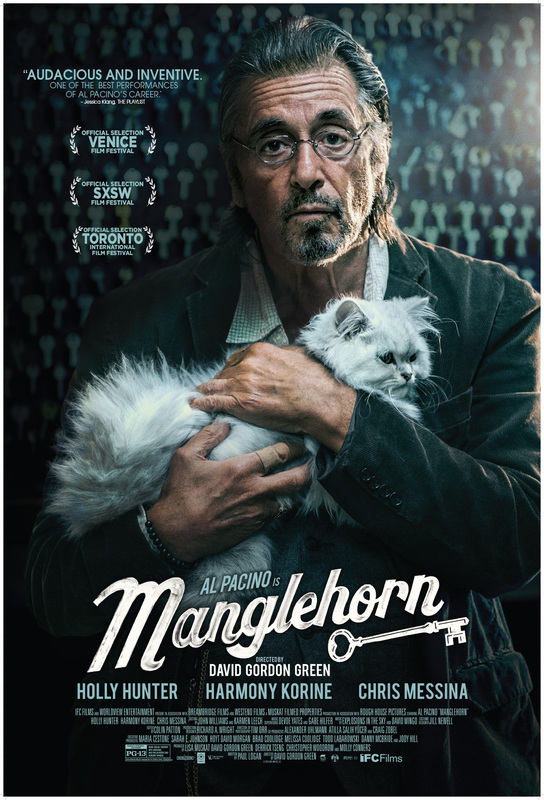 Manglehorn, a guilt-ridden, lonesome locksmith in a small Texan community, Pacino’s role calls for introspection, pause, and constant calm; no “hoo-ahs!” would have been appropriate. 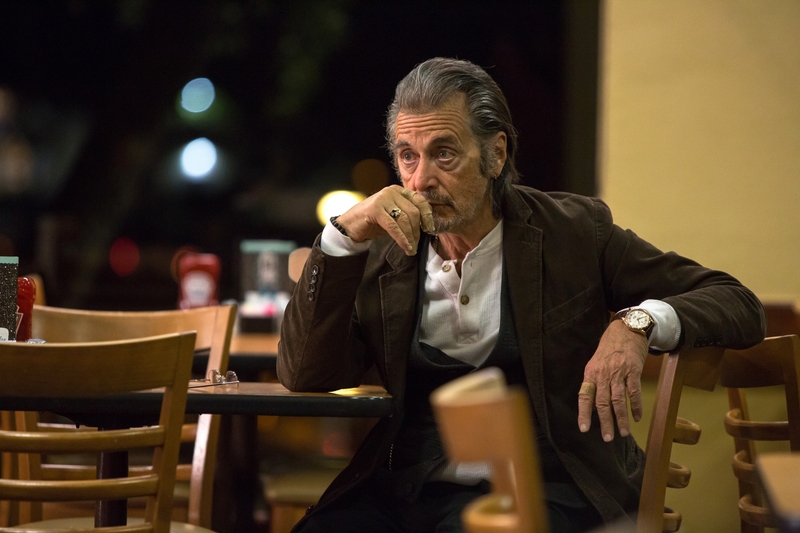 On this point, Green prepared for the worst, and Manglehorn exists best as a visual document of reflexivity to which Pacino gives himself admirably. A.J. Manglehorn is an amalgam of the actor’s past roles, as they might exist after twenty-five years in Witness Protection. Most days, he roams his little town (unnamed, naturally) without a path in mind, pining for a woman named Clara who may have left him, or died, or never existed. Some nights, he drinks, shoots a pistol, and berates his distant son (Chris Messina, in sharp form) for taking after him and becoming insular, irate, selfish. On Fridays, he takes the week’s earnings, and goes to the bank to see a lovely teller just a few years his junior. And since she’s played by Holly Hunter, we know immediately that the locksmith wouldn’t stop at an ATM even if he saw one. Pacino has stated that Green is an artist, not a journeyman, and while I can’t but agree – just last year, George Washington’s Criterion release factored into my curriculum at the University of Texas, and sparked hours of discussion amongst many more learned people than myself – their collaboration nevertheless feels more like festival baiting than artistic experimentation. It’s true that the film provides the multi-Oscar nominee with a tender showcase, his face often regal in neon purples, superimposed close-ups bringing out his greasy hair and spectacles. Pacino and Logan suggest wells of experience in Manglehorn, perhaps even a criminal element to his past, but he never once seems more than the sum of his tics; even when he blows up at a guileless former protégée (the director Harmony Korine, gleefully trashy), his anger seems momentary, pointless, passing. And perhaps, for a man of a certain age, this is the point – Manglehorn talks often, in whispery narration (a Malick-inspired holdover from Green’s own past, garish in its employ here), about his experience with time. But for the other characters in Logan’s universe, time is relative to their connection with the locksmith, and only Messina’s character has a moment on camera to himself. As Dawn (as in, a “new one,” according to Logan. Could we not, please, gentlemen? ), Hunter is given exactly one scene with Pacino of any dramatic imperative, in which they attempt to go on a date in a cafeteria with pathetic results. Hunter’s immense presence and beauty are so underserved by the role that this scene radiates as the film’s strongest without generating a scintilla of genuine emotion, aside from the minor pleasures of seeing these accomplished actors work together. Looking back on it as I write this review (I first saw the film as an Official Selection of the 2015 SXSW Film Festival), its rudimentary assembly became sadly clearer: a cycle of two-shots from Orr; Pacino at his gruffest and most obnoxious; Hunter bubbly, incandescent, and caged in static medium shot. There’s no style to speak of, nor concern for these characters; and therefore, there’s no substance. So where does Manglehorn ultimately play into Green’s canon, especially as he nears completion on his next directorial effort, the Sandra Bullock-starrer Our Brand is Crisis? I can’t help but argue that something feels wrong, despite Orr’s focused and lovely cinematography, and the competent Wingo/Explosions score (for their best recent work with D.G.G., revisit the stunning Prince Avalanche soundtrack as soon as possible). Innocence and curiosity in the camerawork, a spontaneity of plot, and Colin Patton’s normally stolid editing all seem equally lost. At the same time, Manglehorn reminds us of its director’s remarkable aesthetic facility and sensitivity to performance; the film’s peak moments, like the scene in the cafeteria and A.J.’s attack on his wayward admirer, Gary, reinforce Pacino’s claim that Green is an “artist,” rather than a “journeyman.” It seems, after all, that the Green completists and the Pacino obsessives will be pleased – and this, I suppose, was what I myself came to Manglehorn in search of. Right? Editor’s Note: Manglehorn is available on Video-on-Demand and in select theaters around the country. Production stills and access provided, with much gratitude, by IFC Films. The film was also an Official Selection of the 2014 Toronto International Film Festival.